When the Boston Celtics sputtered through the regular season, they were dismissed with descriptions appropriate for a high-mileage car. They were old, slow and unreliable. They might have leaked leads often this season — particularly in the fourth quarter — but they are still effective in large doses, and Rajon Rondo, their point guard, remains a blur on the court and a pest to opponents. 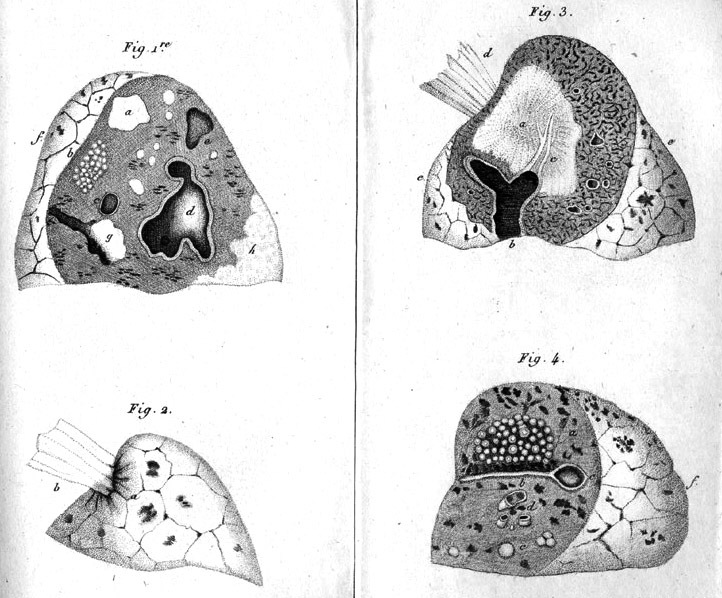 This blog is ostensibly about science, especially in its intersection with public life. It does a fair amount of politics/critique of political coverage (in which I try to nod, at least, at something informed by science defined pretty damn loosely). But every now and then the reader and writer in me just gets loose. Oh FSM, is this bad writing. Not only do the images collide into incoherence, the whole thing just doesn’t make sense. How does being a drug that is effective when consumed with Belushi-like incaution fix leaks? I mean, huh? But while the play of images can truly transport a reader into the world of the story, you have to remember: you, the writer are the master and commander of that transport, and not the other way round. The author of the passage above had long since lost control of his charges. What you see there is what happens when the inmates (swarming one’s brain) take over the asylum. *I know, I know. But I got my professional writing start at Time Inc., where not only backward reeled the sentences until boggled the mind, but alliteration alleviated that aggravations of the day. Sometimes the apple just doesn’t fall that far from its aboriginal arborial accomodations. Don’t forget to tip the nice people bringing you drinks — and come back, y’all. I’ll be here all week. 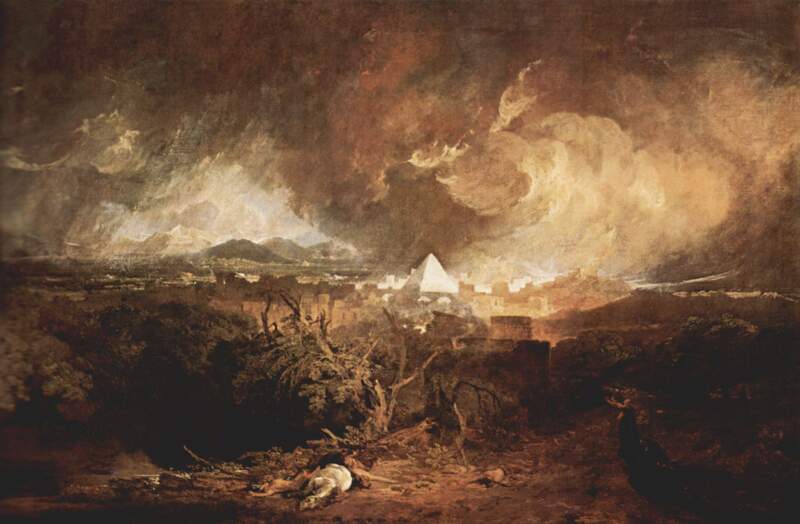 Image: J. W. M. Turner, “The Fifth Plague of the Egyptians: The Plague (die Peste).” 1800. O.K. : I know it’s a reach. But I love Turner, and the title almost gets us there, and heck, it’s no more a non sequitur than anything in the original, so there. Plus, it’s my blog. Also. Just a bit of mild snark to start off what augers to be a depressing week: According to NPR, physicists go fishing ediThtion. I always get into trouble with these, but I’m an editor’s son, so I can’t help myself. “Everybody’s so jazzed that the machine’s actually working,” says Zach Marshall, a graduate student on a detector called Atlas. “But we’re all just waiting with baited breath, because it’s been so close so many times,” he says. Now I know that English usage changes and that we move with the times/practice and all that, but breath is baited only in certain, unpleasant-to-visualize circumstances. The proper spelling of this word/phrase is bated breath, which, as this brief etymology by Michael Quinion describes, has a very distinguished pedigree. First found in written English in the mouth of Shylock, speaking to Antonio in Shakespeare’s Merchant of Venice, it has persisted as a sport of the still-common verb, to abate. The misspelling NPR commits is becoming increasingly standard, however, and as Quinion suggests, that way lies linguistic change, however much curmudgeons like my mother’s son may protest. But c’mon: I have this vision of poor, ill-transcribed Mr. Marshall, standing before his NPR interviewer, night crawlers dangling from his mouth, trout gaping at the proffered meal. 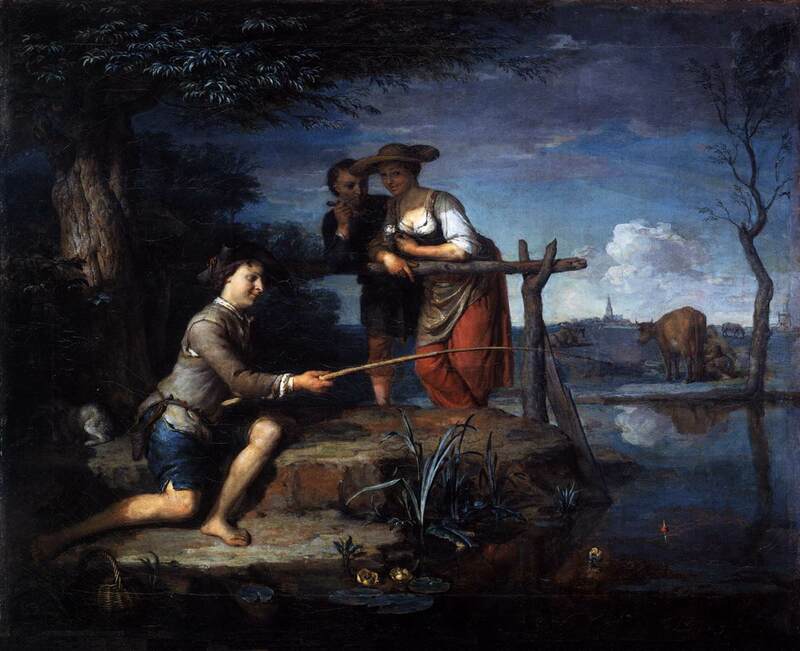 Image: Carel de Moor, “Angler,” c. 1700. Tonight, Thursday, October 15, Andrea Barrett — wonderful and much acclaimed novelist and short story virtuouso — will be giving a rare talk in the Boston area. Barrett is the perfect creator of fictions to speak to an MIT-esque audience. She creates powerful stories, lives examined in connection with each other, under the pressure of selves, loss, time. And much of what those characters care about has something to do with science. Barrett is best known, I think, for her jeweler-precise use of the history of biology as engines for her stories, though geology certainly comes in, and in the work I’m reading today, The Air We Breathe, the paleontology that forms one of her people’s passions jostles with the history of x-rays, chemistry, and the fact and feeling of ideas of health and disease as it organized itself around the TB epidemic of the early part of the last century. Best of all, her treatment of all this is meticulous, accurate, engrossing — and yet always in service of the story. Great stuff, both for those whose first love is fiction, and those, like me, who wonder how best to speak of science to our fellow citizens. Also — if you like the public seals of approval: Barrett won the National Book Award for Ship Fever, a story collection, received wide acclaim and best seller status for several other works, of which The Voyage of the Narwhal might be the best known, and has more recently published Servants of the Map* and The Air We Breathe. She can add a MacArthur “Genius” Fellowship and finalist recognition for the Pulitzer to her trophy case — but the point for me is that the work is consistently gripping. *This collection of stories can serve as a deft introduction to the history of evolutionary biology from early nineteenth century efforts to reconcile the fossil record with scripture, through the impact of the Darwinian moment, to the present day. It’s a full-service read, IOW. Image: René Théophile Hyacinthe Laennec (1781-1825): De l’auscultation médiate, 1819.